Five champions of the Latino community were awarded for their services at ALDIA's 1st Annual Latino History Luncheon. (From left to right) PA Secretary of Education, Pedro Rivera, Karla Hurley, President of Global Bilingual Solutions, the Honorable Nelson Diaz, Exec. Director of Norris Square Civic Association Patricia DeCarlo, and PA Secretary of State, Pedro Cortes. Photo: Peter Fitzpatrick/ALDIA News. 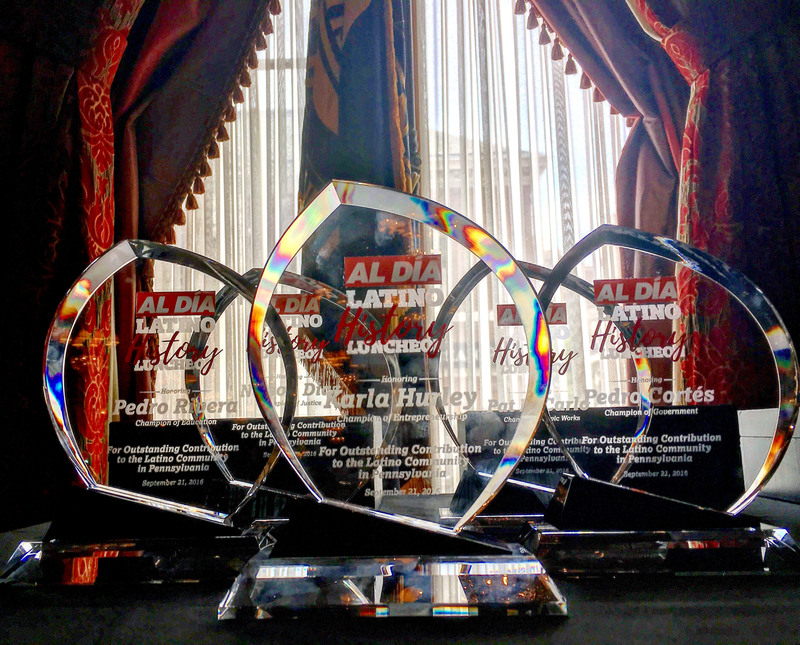 Five pillars of the Latino community were awarded at ALDIA's 1st Annual Latino History Luncheon which was held at the Union League in downtown Philadelphia yesterday. Pennsylvania Secretary of Education, Pedro Rivera was given the Champion of Education award. The Champion of Entrepreneurship award was given to Karla Hurley, President of Global Bilingual Solutions, while the Champion of Justice award was given to the Honorable Nelson Diaz. Executive Director of the Norris Square Civic Association, Patricia DeCarlo was presented the Champion of Civic Works award and Pennsylvania Secretary of State Pedro Cortes received the Champion of Government award. The awards are intended to bring to light the accomplishments of Latinos in realms of Business, Education, Government, and Civil Service.